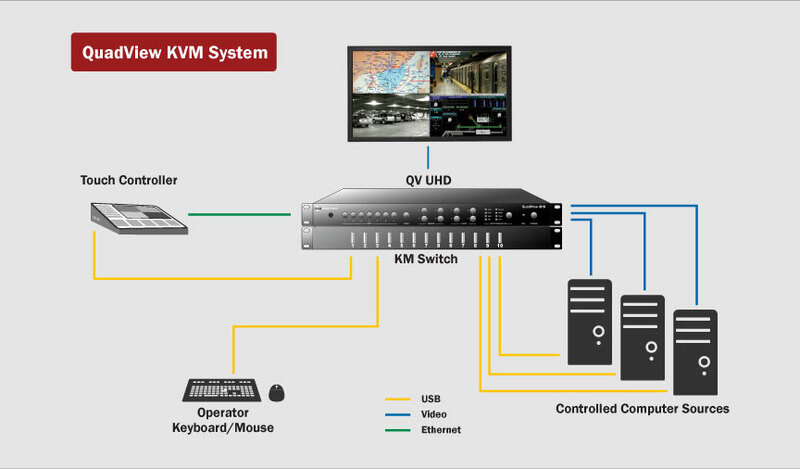 RGB Spectrum’s QuadView® KVM system combines a high-performance multi-image video processor with remote keyboard/mouse control of connected computers. It is designed for displaying and controlling up to four sources simultaneously in a variety of window layouts. Touch-enabled routing with synchronized control switching provides fast access to any of up to seven computer sources. Connect the included QuadView UHD to any monitor or projector from XGA up to 4K resolution and you’re ready for the next generation in multiviewer performance. You can mix and match input resolutions, scale any video input up to UHD resolution and route any input to any window. Both HD and UHD inputs can be displayed without downscaling, taking full advantage of the QuadView UHD’s remarkable image processing. The QuadView KVM’s integrated keyboard and mouse control enables quicker operator response. For example, if a door alarm is triggered, an operator can quickly select the access control computer, find where the door is located, and silence the alarm—all without having to guess which keyboard and mouse is connected to which computer system. The system comes complete with a QuadView UHD multiviewer, touch panel controller, and USB switch, preconfigured as a true turnkey solution. 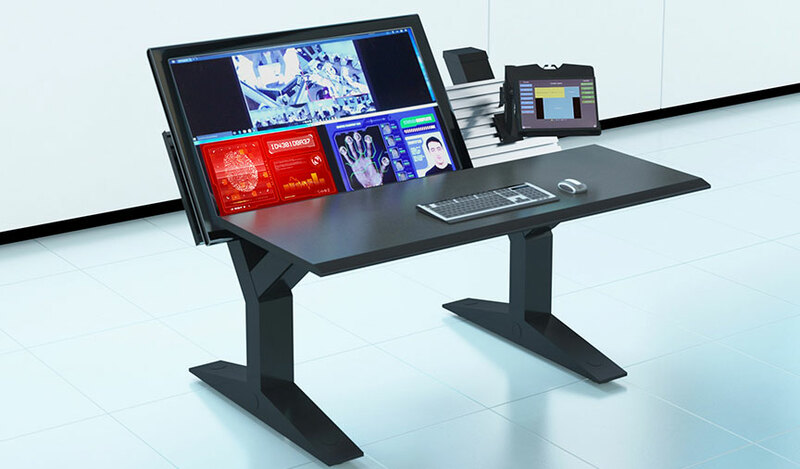 The QuadView KVM is ideal for Security Operations Centers where an operator can quickly respond to an alarm without having to guess which keyboard and mouse is connected to which computer system. The system comes preconfigured as a complete turnkey solution shipped in a single carton. A SOC in a box. The QuadView KVM system’s integrated keyboard and mouse control reduces desktop clutter and enables quicker operator response. Medical personnel use the system for patient monitoring and care. Nurses can track a patient's heart rate, blood pressure, breathing, cardiac rhythm, electrocardiogram (ECG and EKG), and other vital signs, as well as video.